Does junk mail make you see red? If you have presents to wrap this holiday season seeing “red” could be a very good thing. By training your eye to spot the festive colors and holiday symbols that abound in junk mail, you may just discover an unlimited and free source of gift wrap. We all hate junk mail but with a little creativity you can turn it (flyers, glossy newspaper inserts, and unsolicited mailings) into gorgeous and very green wrapping paper. Best of all your lucky recipients will be totally wowed. And you’ll have found a new way to persuasively, but gently, green your world. 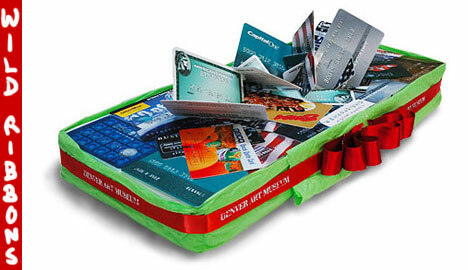 As a warm up to the holiday fun, I’ll be sharing my five tips on using junk mail as gift wrap. For starters, I’ll teach you how to spot the holiday symbols. Spotting the holiday symbols is a fun activity once you get the hang of it. Your whole family can join in (if you let them in on this little secret.) First off, let’s tip our hat to the skills of the advertising folks who design the dreaded junk mail. They are masters at evoking feelings. They know just the heartstrings to pull, and the buttons to push, to make us nostalgic for holiday celebrations. So exploit the ad gurus’ talents to your advantage! Sort through your junk mail, or glossy newspaper inserts now. See if you can spot any Santa’s, snowmen, stockings, sleighs, mugs of hot chocolate, gingerbread men, evergreens — you get the idea! In our home, our junk-mail pile is full of holiday imagery just perfect for gift wrap. All of the gift-wrapped images featured here, and on the next four days, were made from actual junk mail our family received recently. Yes, apparently people all over the world are curious about this art form. Over 9,000 people checked out his site last month. That’s 9,000 people who are — whether they realize it or not — helping to make the world a little greener by reusing junk mail. Now that is a green gift! Tip 5: Wow your friends! So if you’ve been following our Green Delights of Junk Mail Gift Wrap series you’ve learned to spot the Holiday Symbols. You’re on the look-out for visually striking images. You’ve unleashed your inner wrap artist and you’re going wild with ribbons. Most important, you’ve discovered that junk mail offers gift wrap for all occasions — totally free! Now what? 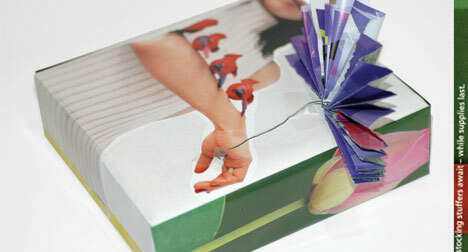 We’d love to hear your friend’s and family’s reactions to your stylish junk mail gift wrap. Were they surprised as much by the thoughtful and clever wrapping as the gift itself? Did you prompt a conversation about living green? Did you inspire anyone else to be a little greener? Let us know! The five green tips were written by Franke James in 2007, for PlanetGreen. 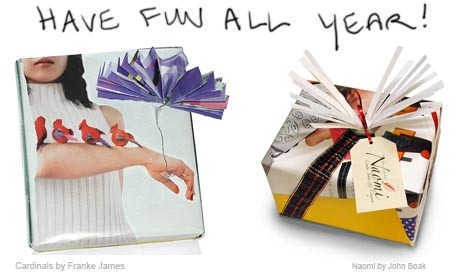 Photos of junk mail gift wrap by Franke James; Ads featured in gift wrap were from unsolicited mailings or newspaper inserts. OOOH franke – what an awesome idea – this makes me very happy just looking at it. Hi, Franke! Wish I’d read this prior to wrapping presents. What a great idea! I will bear in mind for future. I don’t think this tip is limited to Christmas gifts. I think it would work all year long. I have used pretty paper bags as giftwrap before. I love your work! I will be definitely checking in to see what else you have in store! I really like this idea. Now if I can just muster up some creativity and origami talent! Franke, this essay is fun because it mimics the “But WAIT! There’s MORE!” timbre of your standard late-night TV ad, the same breathless tenor seen in the more cheesy paper ads. Nice! :)… entertaining. Thanks. Nice post. 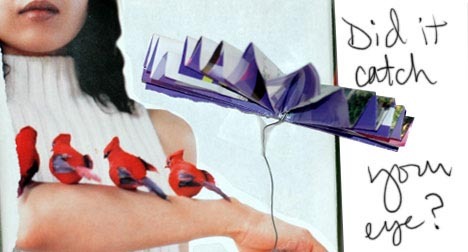 Never thought of doing this with junk mail. Actually we have a special sticker on the door so we don’t get any junk mail. I guess I should go more often to seminars. There I can get lots of junk folders as well.